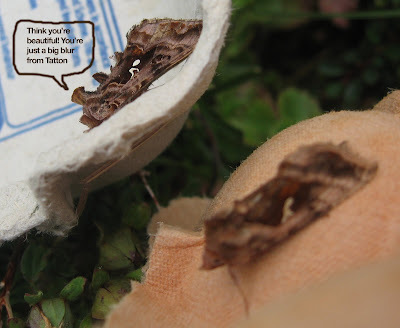 specially as I had missed it at first when I gazed at the multitude of yellow underwings in my solitary eggbox and the scrunched up newspapers which I am using while Penny and I eat as many eggs as we can stand, to restock. I went back a couple of hours later to sort out the trap, because it had rained and things were a bit damp. There was the moth, patiently waiting on the outside of the trap's black plastic bowl. Waring, Townsend & Lewington (my moth Bible) say that the species has a habit of coming to light but not entering the trap. How right they are, once again. The moth was a very co-operative photographic model, and I eventually hid it deep in a creeper, as it had started raining again. Indeed at midday we had hail. Now the sun is out again, although this isn't particularly good news for green moths. Their colour fades faster in the light than any other in the spectrum, although the Large Emerald is known, and admired, for staying greener longer than any of the others. Why are there so many yellow underwings? Although it rained last night, there were well over 150 in the trap this morning. They must feed something; indeed I know several blackbirds which enjoy them occasionally when I fail to hide them well enough after checking the catch. The different types - Large, Broad-bordered etc - far outnumbered the score or so of Dunbars, Beautiful Golden Ys et al which were slumbering beside them. There was also this lovely little 'yellow overwing', or rather yellow and orange. I think that it's one of the Tortrix micro moths. You can see how small it is by the size of the Yorkshire Post's type, and I've blown up part of the pic further to show you another pair of palps (see two posts below). If you click on it to make it even bigger, it looks like an elongated version of one of those sinister sheep or cattle skulls you sometimes find when out walking. It's my younger son's birthday today, hooray. I've been trying to find a birthday moth or an Oliver moth but so far have only discovered a YouTube clip online which shows a cat called Oliver having a fight with a moth. Reminds me of a family trip to Nimes where they told us that the Roman provincial administration was so strapped for cash that fights in the amphitheatre were sometimes between sheep, ducks, bees etc. I am collecting eggboxes at the moment. The whole family is risking becoming eggbound in the interest of moth trapping. I don't like using the big bowl with nowhere for the insects to creep away and sleep, pending my arrival in the morning. Meanwhile, here are two slightly different views of recent arrivals: I crept up behind the Scalloped Oak (above) to catch the extreme tilt of its body at rest. Does all its blood rush to its head? And you can see from the similar rear view of an Early Thorn (right) why moths can spot you more or less wherever you are. Look behind you! Yes, it is doing. The third pic shows the Thorn from the side, with its characteristic and unusual 'butterfly' way of holding its wings vertically when in repose. Lots of brown and black and grey in the trap this morning. Boring superficially, but when I looked more closely at this Marbled Minor I noticed its palps. Looking like a tiny pair of pliers, they are thought to help moths with touch, taste and possibly movement and navigation. My camera isn't good enough to bring out all the amazing detail in moths' faces, but occasionally aspects strike you like this. The dead moth in London, for instance, (a few posts below) has its coiled proboscis partly out as you can see if you click on the pic so that it fills your screen. I don't suppose many of us come across the word 'palp' in daily chatter, but it is directly related to 'palpable' which is much more common, generally as an alternative to 'clear' in the sense of obvious although strictly it means capable of being touched. So my various online dictionaries tell me anyway. A new butterfly for this year, and a sturdy one. The weather's been pretty dreadful and I had just been mowing the lawn half-heartedly in light drizzle when this Gatekeeper fluttered up from some phlox. Then followed a little chase round the garden as I tried to get near enough to photograph it. in the course of that, it was interesting to see how on settling it very rapidly hides its more brightly-coloured forewings and the dull brown and eye-disorientating pattern of the hind ones makes it hard to see among plants' leaves. Without sun, it seldom spreads its wings to bask, but there's a picture of one doing that way back in the blog, on 30 September last year. The name comes from its preference for the fringes of fields, whereas the Meadow Brown (which it much resembles) likes the middle. Talking of such archives, I looked back through my trapping records (which started in May 2004) and found that an Angle-striped Sallow (see post immediately below) visited the trap in July 2006. Over the years, we have had 19 species of butterfly here regularly. Rather than diminishing, as journalists invariably like to suggest, they have increased both in numbers and actual species. The Speckled Wood, White-letter Hairstreak and most recently Brimstone are among the newcomers. Here's another of them, a Green-veined White, which was easy to photograph by contrast with the Gatekeeper. It was dead. (Sorry, Lorry). I'm still counting the number of moth species. If anyone would like to guess the total, you would be very welcome, and I will immortalise the winner's brilliance in this journal in due course. An unintentional experiment last night: a trap with no egg boxes for the moths to shelter inside. We got back very late from Gatwick and I forgot that I had dumped the previous, and very tatty, stash of them because they had got wet when I forgot to put the trap away and it rained. In the dark I didn't notice that any incoming moths were just going to have to settle down inside a bare, black plastic bowl - except for these two Dun-bars (No! See Comment from Benny riding to my aid again; they are actually the much rarer Angle-striped Sallow, Yo! ), which nicely prove the way that the insects look instinctively for some sort of shelter - in this case the wire from the mercury vapour bulb to a mysterious electrical thing it needs called the choke. The other moth I've pictured is a Lychnis, a newcomer this year. Alas, I haven't worked out how to adjust the camera to the refection from the black plastic of the bowl and when I tried to tempt the moth to a more photogenic setting, it flew furiously away. Oh dear, more death. Avert your eyes, Lorry, my kind-heartened colleague who was saddened by my late sparrowhawk, RIP. Still death is a pretty major part of the genuine natural world; even Beatrix P recognised that with her precis of the fate of Peter Rabbit's Dad. Mr McGregor, we name the guilty man. Imagine what Thos Hobbes would have said about life if he had been born a moth. Anyway, to the point. I'm collecting Penny and her Mum from Gatwick later and I was driving through Regent's Park when this little fellow, or fellowette, flew out from its hiding place in the car and landed on the steering wheel. Hooray, I exclaimed, I am increasing the moth population of London by one. I may also be aiding the spread of species in Britain, something of which I much approve. 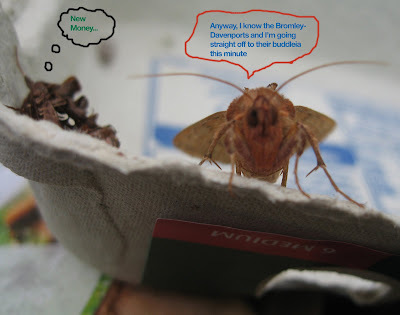 Some ecologists are rather down on this, as 'artificial', but mankind's activities affect the rest of Nature in so many other ways, that a little moth transporting seems a minor form of interference. If you click on the picture you can see its tongue and interestingly fluffy tail, as well as the seat-cover detail from our Toyota Prius (smug smirk from writer; no congestion charge, Yo!) But alas. When I reached my son's flat, I forgot about the moth and it wasn't until the next morning that I went to the car (to avoid about £1000 in parking fines) and found its small corpse on the floor. I have emailed Jax to ask what it is, or Benny may know. I put it reverently in a flowerbed in the local park, which appropriately is the converted graveyard of a Blitzed church and it will rise at the Last Trump, or be eaten by a mouse or bird. Unless it was only sleeping (although it might have been eaten then, too). 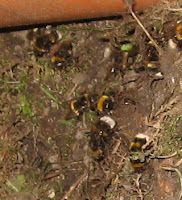 My bee-expert colleague Alison Benjamin (whose book A World Without Bees is a must-buy) tells me that my raided nest (see immediately below) is a bumblebee one; not the big Solitary Bee bumblers which grind about like aerial mowing machines, but a smaller variety. People put flowerpots over them to protect them, she says (making sure that there is an exit hole at the top...) My predator is too big for that, so I've temporarily shielded them with a wheel barrow. And now - Eeek! - what is this? 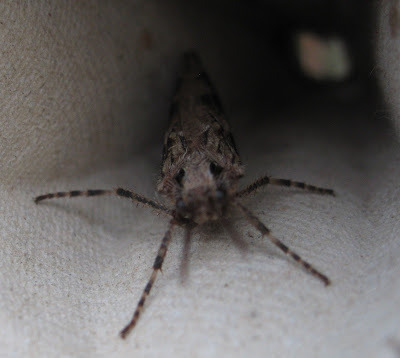 A caddis fly in the moth trap, that's what. It's nowhere near as threatening as it appears here, but resembles a weedy-looking moth with transparent browny wings. The life cycle of the caddis is remarkable; the female insect lays her eggs on the the surface of my pond, or just underwater, and then the amphibious larvae build little houses of mud and silt as well as tiny traps to catch algae and microscopic pond life. They pupate underwater and at hatching time propel themselves to the surface where they struggle free and turn into this. Wonderful! Human birth and life is a pretty arduous experience, but thank goodness we don't have to go through all that. I've never been a fisherman because my boredom-tolerance threshold is too low, but I admire the way they make and use flies. Here's one modeled on a caddis, courtesy of the website of the English Fly Fishing Shop in Morden, Surrey. My main preoccupation this morning is with bees. The moths have settled temporarily into a rather dull routine. I am sorry to be unscientific, but my recording enthusiasm fails in the face of yet more assorted Yellow Underwings and small brown species which I can't tell apart. Sorry. 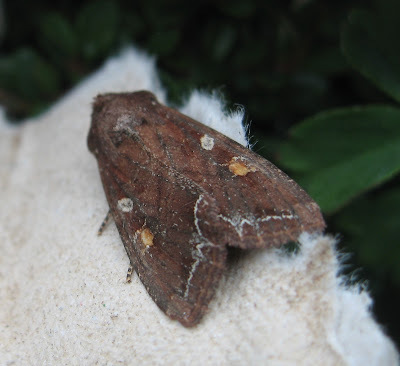 All I can manage to keep the moth flag flying is a nice Dark Arches, below, along with one finger and thumb (which, thankfully for the focus, didn't keep moving). The bees excavated a nest just below one of the pipes through which I covertly draw water from our sloping road's gutter to feed our pond (the thing in the top pic which you may have mistaken for a carrot). We'd watched them fly in and out and rejoiced, amid the almost daily articles about the supposed threat to bees. But then a large animal came along and did some excavation, and this above, is the result. Luckily, I think my pipe has protected the heart of the nest, but it's annoying how Nature can connive at damaging herself. I am trying to find out what sort of bee they are - bumbling in appearance but about half the size of the standard bumble (of which we have plenty). Goodness; a tripartite blog, whatever next (this episode goes with the two below). I'm rushing off to Doncaster but had to add this to show my Mum's hunter's eye. She spotted this Light Emerald (No, it's a Common White Wave - see Benny's helpful Comment) by her front door, which has a light of its own. Nothing like as potent as the mercury vapour one in the trap, but if you have an outside light on warm nights, it should attract moths. A propos of nothing, one of my favourite habits when in London is to walk along a street in somewhere posh like Islington after dark, for the sheer joy of triggering the anti-burglar lights, one after the other. It's like being God at the creation of the world. Let there be light! And there were moths. And YES! There is a Part II, following on from the entry just below. Mum has surfaced and together we have inspected about 70 moths including these - a Lesser Broad-bordered Yellow Underwing scrutinising us in return (above; I like his skullcap, or is it a Beatle fringe going ever so slightly grey, like mine?) Note the nice green too; you often miss that when seeing 'boring brown' moths like this from above. Then we've a Snout showing the reason for its name (sorry about the focus, which preferred the leading edge of the eggbox) and a Wainscot, one of about half-a-dozen. On the vaguely scientific front, none of the catch was different from the usuals at home. So it looks as though I need to venture further afield for that. Penny's floating down the Danube with her Mum this week, so I popped over to my Mum's last night and gave the trap its first-ever outing away from home. It's only a couple of miles round Leeds ring road, but it will be interesting to see if the catch is different at all. At the mo, I'm waiting for my Mum to come-to and glug her early morning tea, because she is a natural predator and wants to see the results of the hunt. The moths are dozing peacefully on the patio. So, I've just photographed a couple which are snoozing obligingly on the outside of the transparent collar; small but exquisitely patterned. I think that the one above is a Marbled Beauty with a slightly tattered Light Emerald behind (No, it's a Common White Wave - thanks Benny - and see two posts above for same bungle by me), and the one below an Engrailed. As you can see, it rained a bit in the night but the trap was protected under a huge umbrella of the rose Mme Cecile Brunner. This may be another ground-breaking post in that there could be a Part II later on, depending on what is lurking among the egg boxes and how much time I have before the Guardian beckons. This post is going to be a little like the List of Visitors which the local paper published in Harrogate, in the days when the town's spa attracted members of the Upper Ten. The heights of ecstasy were reached when three queens stayed overnight; and I remember doing a touching story about a family who still had a christening spoon given to their grandfather by Tsarina Alexandra, the one shot at Ekaterinburg, when she stayed 'anonymously' with his parents who ran a Harrogate boarding house. No such magnificence last night in my moth trap, but some pleasant visitors all the same. They are, in order from the top: a Shaded Broad-bar; a couple of Scalloped Oaks which look like nuns hastening to the aid of a lost soul (the unidentifiable dark moth in the corner of the eggbox); a Dun-bar (I think) with a Heart-and-Darty-type friend; I shall consult the experts on these, dim as I am; plus a wasp. And, finally, a Burnished Brass with its brass nicely burnished. Sorry about the hesitancies. I wouldn't have been good at telling which queen was which in Harogate, either. There's a certain pleasure in recording the humdrum days in life, like seamen in Conrad with their logs: 'Weather changeable. Sea everywhere. No albatrosses.' Last night was one such. All I can offer you is a Treble Bar (left), which wouldn't leave the bottom of the trap where photography is a nightmare; and a Marbled Minor (below). The only possible excitement is that the MM may be a Tawny Marbled Minor or even a less common Rufous Minor, because they can only be distinguished by their genitalia. But I'm opting for the standard version. There were plenty of other old familiars in the trap, but away from moths, we had tea on these special Commemorative Moon Landing Moon Eggs which as you can see, come complete with craters. You achieve this effect by putting the poaching pan lid on top of the frying pan which also has the happy effect of cooking the phlegm. Drops of condensing steam make the craters but timing is everything, unless you like moon eggs with the texture of leather. The biggest of the micro-moths, the Mother of Pearl, has been coming to the trap for several weeks now. But they are very skittery and tend to fly off as soon as I bumble into view. I've managed to photograph a few, but always either a little blurred or without the pearly sheen which is so striking in reality and their distinctive mark. I think this pic does the job, in spite of my trembling hands. It gives a slightly blurred effect initially but if you click on it, you'll see the lovely glimmer of grey, white and mauve. I like the long antennae folded back along the body too. Otherwise greyness ruled this morning, although in an attractive way. I'm fairly sure that we have a Grey Arches here, being examined by the equally grey Poplar Hawk, which is heading for some sort of record for a species continually visiting the trap; it will be two months soon. Finally, below, here's a sad-looking creature which I must check out with one of my more expert advisers - it's either a Silver Y which can be notoriously varied, or one of the Golden Ys down on its luck (see exciting cartoon, several posts below). 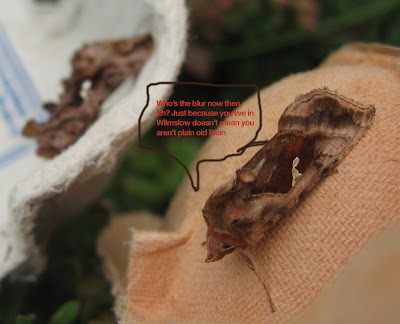 Moths and butterflies get damaged very quickly. I'm currently stalking an incredibly tatty Meadow Brown round the garden in the hope of bringing you a contrast with the spanking new one I pictured a few weeks ago. But in spite of its half-wrecked condition, it's been too clever for me so far. Where do moths go when it tips down, as it did yesterday? They burrow deep under leaves and stuff, which works. I remember doing the same as an Army cadet and later on an expedition in Sulawesi, Indonesia, and being surprised how dry you can stay. This Buff Arches, however, preferred our shower room. Maybe it's a Ukrainian nationalist, or just likes our choice of tile colours. Or did it sleepily attach itself to my pyjamas when I was emptying the trap? My Gilbert White-style studies of the shower room's natural history also revealed this snail. They are great climbers round here; we sometimes watch them sliding up our bedroom windows en route to...where? The roof? I must look at the TV aerial through field glasses some time to see if they consider it their equivalent of K2. Most houses have a spot of moth life. We met my nieces for Penny's birthday tea and one of them reported a chrysalis on her curtains (probably a Peacock's). Her younger sister, who has just been clearing out her student hovel, found three cocoons in a folded-up tablecloth. I didn't know that students had tablecloths. All is not lost. It's been pouring with rain for hours, but the birthday got in before the weather broke, and fun was had by all. Moths took a back seat but I sneaked quickly away to stalk this Red Admiral, the first of the season, in a pub garden in Wharfedale, and saw another on a lovely walk round Swinsty reservoir (which has an amazing number of memorial seats saying that it was so-and-so's favourite part of the world). This Ringlet was also there, with unusual markings. Some slight aberration? Or, more likely I think, the scars of an encounter with a bird or a thornbush. The moth trap occasionally creates victims; a very few of the insects seem to keel over at the bottom of the bowl and I suspect that one or two others fall prey to birds, however carefully I try to hide them in the morning. But then life is dangerous and hazards can be surprising. Consider windows, because they're what brought down this magnificent sparrow hawk. I was reading on the sofa when there was a real 'whump!' at the window which shook the glass but luckily didn't break it. Outside, stone dead, was the bird, still with this tangle of wool in its imposing talons. If you look carefully at the third picture, you can see where it hit the glass. A sinister ghostly outline which shows the strength of the impact. If you click on the pic, it should turn enormous and fill your screen with the traces. The hawks are a feature of local bird life, making pathetic-sounding tweets which belie their size and armament. The ladybird is one of several which form a clue question (How many ladybirds can you see at this house?) on an annual treasure hunt by a local school. When my children were here, they evilly removed one ladybird halfway through the afternoon, thus altering the answer, as happened with Gladstone and the Irish Question, according to 1066 and All That. I've reflected before on the number of brown moths in Britain. Now that the evenings are often warm, you can see them on the wing, flying faster and more jinkily than butterflies because of their larger and presumably more powerful bodies, and smaller wings. If you get close enough, or one stays still long enough - the great advantage of the dopiness induced by the light trap - you can see how subtle the 'brown' really is. This visitor (above) is the Bright Line Brown Eye, although this particular specimen has a whiter second eye than most and might be more accurately be called the Bright Line Brown and White Eyes. Moths are very variable. I just checked that I'd got the words of its name in the right order and found that I hadn't. The index in my book said Brown Line Bright Eye. But then, unusually for a journalist, I double-checked and found that I was right after all. There is both a Bright Line Brown Eye and a Brown Line Bright Eye - pictured right, brilliantly camouflaged, courtesy of a very good website called www.vc66.co.uk which seems to be run by someone on Teesside called Me. Both the BLBEs are common, but the other one has not yet called here in Leeds.